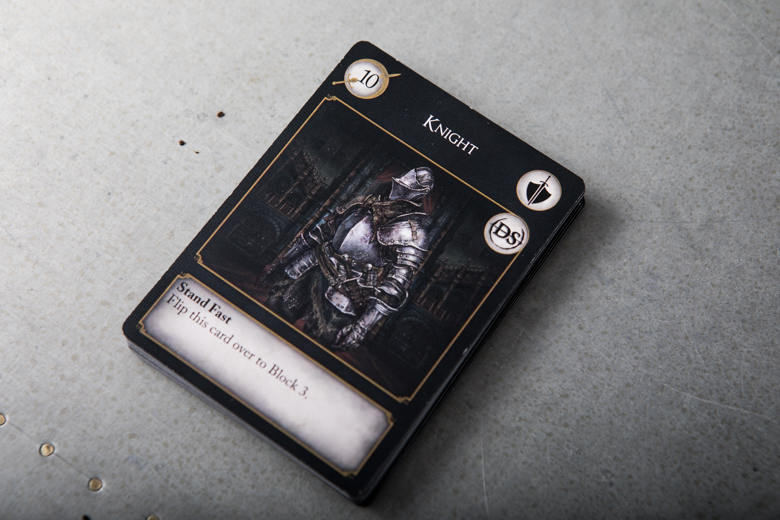 Dark Souls The Card Game is the latest attempt to bring the unique challenges of video game developer From Software’s winning formula to the tabletop. But does it succeed? The Dark Souls video game series teaches you about fear and punishment but gives you a sense of achievement like no other game. The good news is that Dark Souls The Card Game does an excellent job at replicating the feel of its source material. It keeps you on the edge of your seat in anticipation of the inevitable pummelling you’ll receive at the hands of undead soldiers, leaping goat creatures or hippos with fists for mouths. Yes, Dark Souls fans: those monstrosities are in the box, waiting for you! 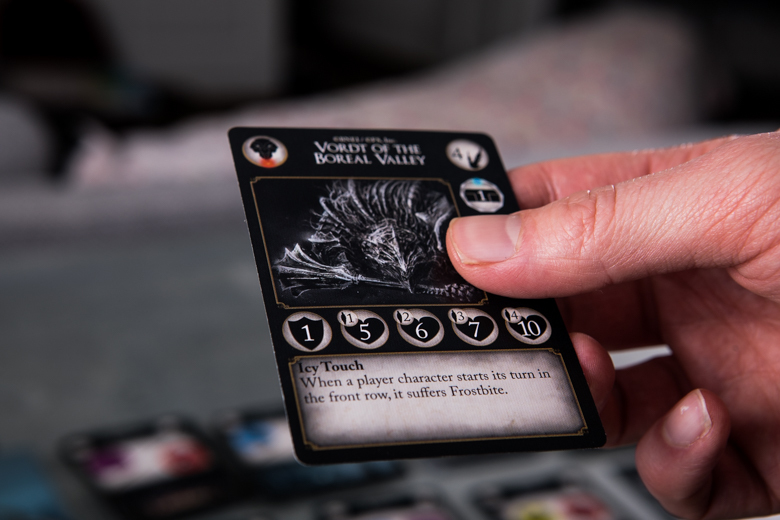 Dark Souls The Card Game is a well-paced, cooperative, deck building card game that requires tactical awareness, risk-taking and, to some extent luck. It is difficult, but like its videogame counterpart, it doesn’t ever feel unfair. Let me show my hand straight away – I’m a self-confessed Dark Souls addict, although that’s not always been the case. Having heard about the brutal difficulty of the series, I was always tentative about playing the game, despite calls to arms from the rest of the Boards and Booze creative team. Even back in the nineties (when video games were actually difficult), I had no desire to waste hours of my time fighting my way past an impossibly hard hairy spider only to fall into a pit three screens later! The prospect of doing the whole thing again did not appeal. But after finally relenting to pressure from my ‘friends’, I realised this was exactly what I wanted: to feel challenged. Winning feels better when you feel you’ve suffered to get there. As a fan of Liverpool FC, I should know! But although the Souls video games evoke the challenge of the nineties they are very much their own thing. Where so many games of that era felt unfair or governed by random chance, Dark Souls rewards skill over luck. You learn through failure, progressing not through repetition but through the gradual mastery that comes along with it. The series’ celebrated boss battles are in many ways an embodiment of this. It’s a fist-pumpingly fantastic feeling to finally take down the Dancer of the Boreal Valley, for example, after taking so much punishment at the hands of her mesmerising blades. 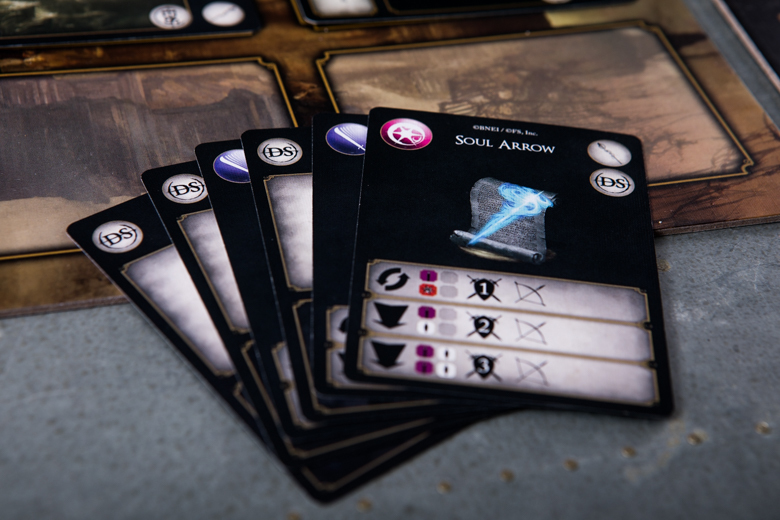 Dark Souls The Card Game offers the same sense of achievement. You just need to accept that you’re going to be repeatedly punched in the face on your way to getting there. 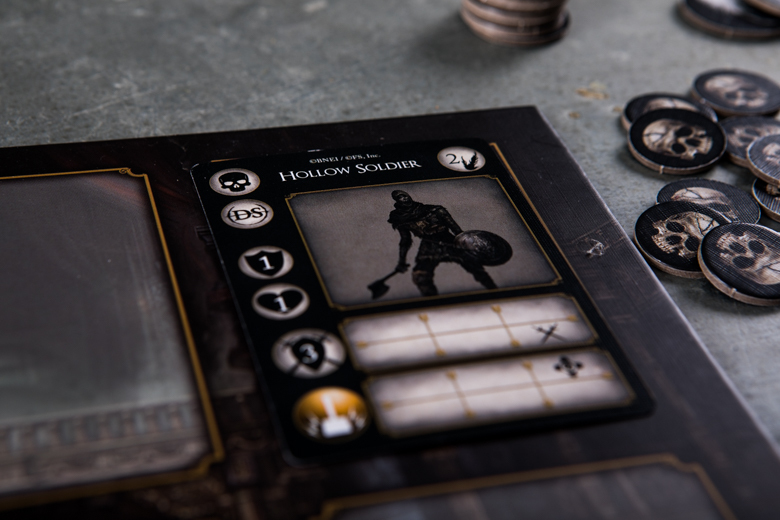 The Dark Souls card game is made by Steamforged Games, the same company responsible for Dark Souls: The Board Game. The board game was funded by a hugely successful Kickstarter campaign, but responses on release were mixed. While it had stunning miniatures and excellent combat, it was let down by an unclear rule book, and frustrating movement mechanics. Perhaps most disappointingly, it struggled to capture the unique feel of its source material with much success. 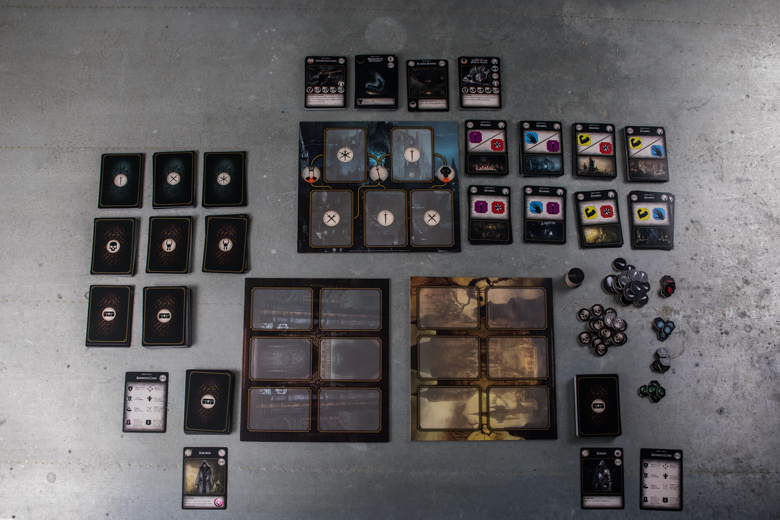 Structurally, Dark Souls The Card Game follows a similar approach to the board game. But by simplifying the rules, increasing the variety of enemies you encounter, and speeding up the gameplay, it improves hugely upon its big brother. It’s a one- to four-player cooperative game, where players choose a character class (Knight, Assassin, Herald, Sorcerer), each with its own associated deck. We’ve tested the one and two player experiences, and though it’s more enjoyable (and slightly easier) having a fellow glutton for punishment fighting beside you, the game still works well as a single player experience. Although it’s technically a card game, the game is played on three boards. An encounter board tracks your progress towards the infamous Dark Souls bosses, while the enemy board helps you arrange and move the bad guys. Finally, there’s the players’ board, which dictates your position and is where the enemies attack. The aim of the game is quite simple, and mimics the video game (unfortunately without the mimics). You’ll work your way through a series of battles, fighting enemies until you’re ready to face a boss. You must defeat two bosses to win. Players’ health is dictated by the cards in their hands: run out of cards, and you die. When this happens, your whole party returns to the bonfire and you start again. Your party can only return to the bonfire five times, however – any more, and you lose. As some of the more hardened members of the Dark Souls community are quick to point out: to win you need to git gud! This means you really need to look at the number of cards you have left after every encounter, and make a decision. Will you progress onto the next fight to get more loot, or return to the bonfire to restock your deck? This is where things start to get interesting: your deck also powers your attacks. As you progress, you draw cards into your hand, which can include weapons, spells and, importantly, stamina. These stamina cards represent different stats (Strength, Dexterity, Intelligence and Faith). To perform attacks with different weapons, you need to use the relevant stamina card. This mechanic is what makes the game tick. It asks you to walk a fine line between defence and attack, forcing you to really think about your next move. Spending all your stamina cards on a heavy-hitting attack will leave your defence vulnerable. But try to conserve health by blocking too much, and you won’t have enough stamina to attack. This also leads to some cool character building, as you can buy different stamina cards depending how you want to build your character. Is that a Soul Arrow in your pocket, or are you just pleased to see me? Mechanics aside, one of the best things about the game is the sheer variety of enemies you’ll meet. You’ll draw new foes each time you replay an encounter, neatly avoiding that grinding repetition of the board game. But who wants to talk about the foot soldiers? Dark Souls is all about the bosses. These nemeses of every series aficionado are responsible for many a controller-launching trip to the Emergency Room. There are four bosses in the box, but no doubt expansions will make more available in future. The boss fights are where the fun (and the challenge) really ramps up. Each boss has its own deck of moves dictating how they pulverise your intrepid team of adventurers. This lets you learn the bosses’ moves and try to anticipate where the next attack is coming from. It’s a neat way to capture some of the feel of the video games. 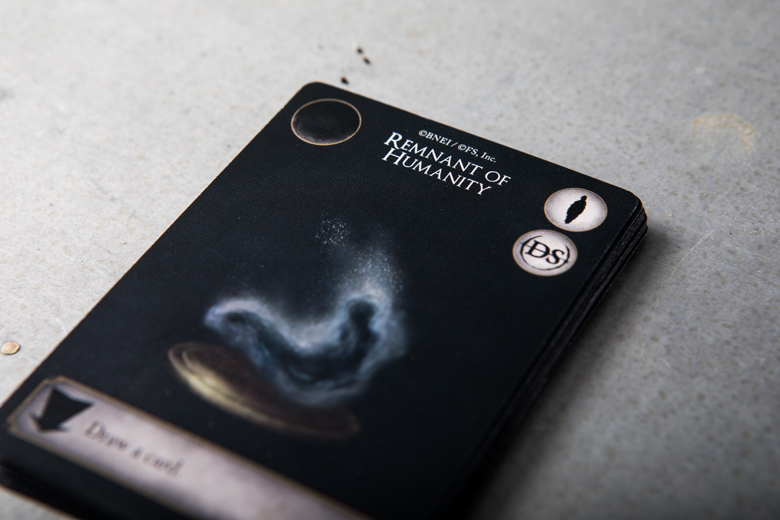 What’s more, it goes a long way to making the card game feel like a ‘proper’ Dark Souls experience. None of this is to say that Dark Souls The Card Game is perfect. I would have to again critique the rulebook. It’s just not set out in a logical way, and some of the rules are a bit vague. Some of the artwork (particularly the iconic encounter areas) is too dark as well. I know it’s called Dark Souls, but I would still like to see more than poorly-lit dungeons. Other minor quibbles include the potential for frustration if you expect to be able to attack every turn (you won’t be able to, trust me); the missed opportunity to include the lore of the game within the item descriptions; and the lack of PVP (which Eric Lang’s Bloodborne card game introduced ingeniously). But overall this game is a winner due to the fun, uncomplicated but still tactical combat, excellent use of the Dark Souls IP, and pacey gameplay. 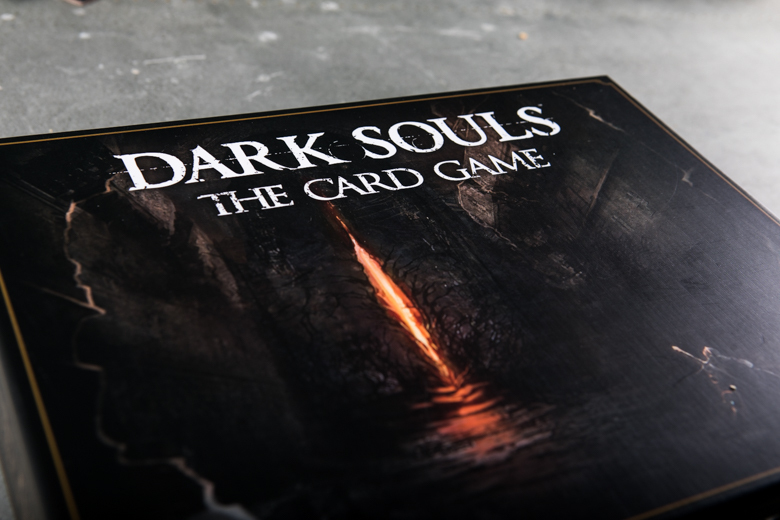 If you love the series, have masochistic tendencies, or just fancy a challenge, Dark Souls The Card Game is what you’ve been waiting for. It’s time to get out your carrier bags, dust off your riding crops and memorise your safety words: you’re going to enjoy yourself.